Forget the unified Pixar theory. Or rather, let's get more granular than the unified Pixar theory. Have you ever given much thought as to who Andy's mom is in the movie Toy Story? Random, I know—but, hear me out! There are more similarities between Jessie's hat and Andy's hat than there are between Andy's hat and Woody's, no? Now let's look at when Jesse is introduced to us—this is the hat we see on Emily's bed (Emily, if you don't recall, is Jessie's original owner). Obviously, none of this proves they're the same person—but hey, there are enough similar details to consider it for a moment, no? And if Emily and Andy's mom are the same person, it would make the story better, I think. 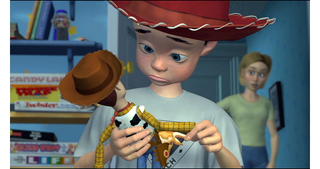 Both characters had a strong connection to their toys growing up, both eventually forgot about their toys, but both passed on some part of that love to other kids. Sad, but lovely in a way. You can read a more detailed breakdown of this theory, including additional pictures, here.